The Morality of Health Care Reform, Pt. 6 | The Morality of Health Care Reform, Pt. 6 – The Republic of T.
If the cliché that a picture is worth a thousand words is true, then a couple of images might sum up the debate of over health care reform, and prove representative of the opposing sides. President Obama also defined it during his speech to the joint houses of Congress: that debate over health care reform is really a debate — and a struggle, even — over the moral character of the nation. In other words, it’s another part of the process of choosing what kind of country we want to be. I’ve thought about that phrase quite a bit in recent days—the character of our country. One of the unique and wonderful things about America has always been our self-reliance, our rugged individualism, our fierce defense of freedom and our healthy skepticism of government. And figuring out the appropriate size and role of government has always been a source of rigorous and, yes, sometimes angry debate. That’s our history. But those of us who knew Teddy and worked with him here—people of both parties—know that what drove him was something more. His friend Orrin Hatch—he knows that. They worked together to provide children with health insurance. His friend John McCain knows that. They worked together on a Patient’s Bill of Rights. His friend Chuck Grassley knows that. They worked together to provide health care to children with disabilities. That large-heartedness—that concern and regard for the plight of others—is not a partisan feeling. It’s not a Republican or a Democratic feeling. It, too, is part of the American character—our ability to stand in other people’s shoes; a recognition that we are all in this together, and when fortune turns against one of us, others are there to lend a helping hand; a belief that in this country, hard work and responsibility should be rewarded by some measure of security and fair play; and an acknowledgment that sometimes government has to step in to help deliver on that promise. 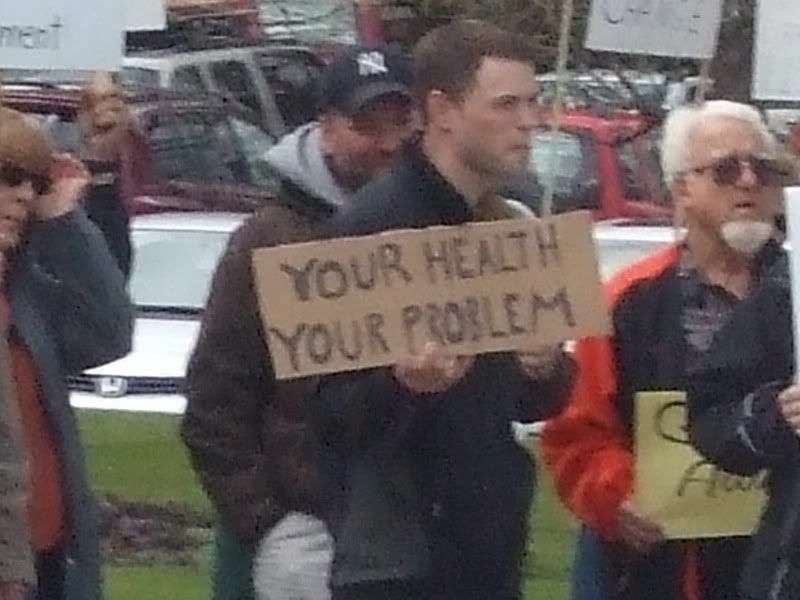 If the two sign-holders above represent the two sides of the health care reform debate, the president filled the gap between the those two points of the political spectrum, and attempted to deconstruct the false dichotomy between “standing on your own two feet” and “walking a mile in someone else’s shoes” — a necessary act of dealing with crises that test the limits of “rugged individualism,” our capacity for (here comes that word again) empathy, and can’t be solved by either alone. In the previous post in this series, and in another post, I suggested or hinted at two ideas that I didn’t state outright, choosing instead to explore them separately in hopes of putting them together in some final piece of writing, and I’ve gotten it down to one sentence: Thirty years or so of dominant conservative economic policy has not only created crises too big to be solved by “rugged individualism” or empathy along, but come close to destroying the one concept that might lead to real solutions: the idea of a common good. Somewhere between “We Can Do It,” “We Shall Overcome” and “Yes We Can,” Americans have gone gone from being anything close to resembling “We the People” to having nothing in common; least of all a common good. This is not a new observation. (Many others have written about it in the past few months, and I’ll quote quote them liberally here when they’ve already said what I want to say — and better than I would say it.) It’s just one that bears repeating, as even in the course of the health care reform debate lawmakers are having exchanges like the one between Senators Jon Kyl (R-AZ) and Debbie Stabenow (D-MI). As the Senate Finance Committee moved into its fourth day of deliberations over the health care bill, tensions continued to rise. Sen. Jon Kyl (R-Ariz.), broke new ground defending an amendment he’d proposed that struck language from the bill defining which benefits employers are required to cover — in this case, basic maternity care. The amendment was defeated, nine to 14. As Ellen Goodman pointed out, as if in response to Kyl’s remark that his mother may have needed maternity care “more than 60 years ago,” his wife and daughter probably did too, much more recently than the day the congressman came into the world. So, too, might any number of women — who didn’t choose to be born with a uterus, as Jonathan Cohn (who, like Kyl didn’t choose to be born with the Y chromosome that ultimately exempts him from needing medical care). The same, as I (also born with a Y chromosome that exempts me from needing such benefits) pointed out, goes for women who are raped, pregnant, or victims of domestic violence. Neither I, nor Cohn or Kyl will ever need maternal care, or be denied insurance because of pregnancy. But as Stabenow pointed out to Kyl, there are people in his life — people he presumably cares about — who have needed such benefits and may need them again. Likewise, I’ll never need maternity care, but my mom did. My sister did. My nieces will. And a number of women I care about have and will again. The same can be said for just about any health issue; not just those specific to women, but that can affect us all. Goodman writes that Kyl’s statement offered “one brief glimpse into the mind of a politician who doesn’t quite see women’s health concerns as equal to his own.” It’s reasonable to extend that to say that perhaps he doesn’t see anyone’s health concerns as equal to, or connected to his own. I might add that Kyl’s remarks make it clear that for him “we” doesn’t extend much further than himself and perhaps those in his immediate family. But, as Jonathan Cohn makes clear, when it comes to health and health care reform “we” needs to be much, much bigger — for all of us. Kyl was born with a “Y” gene. For this, he’s earned the right to pay lower health insurance premiums? To be sure, not all medical expenses are completely out of our control. Lifestyle choices can certainly influence everything from whether we get heart attacks to whether we (or our partners) get pregnant. That’s one reason that some financial incentives to encourage healthy behavior, like charging higher premiums to smokers, make sense. But there’s a great deal over which we have little control, from genetic anomalies to random car accidents to economic circumstances in childhood. That means every single one of us face the risk of substantial or even catastrophic medical bills. Sharing that financial burden collectively is not just the sensible thing to do. It’s the right thing to do. Kyl’s response, both in word and spirit, are the essence of the point of view in the first photograph above: “Your health. Your problem.” Some women need maternity care? So what? He doesn’t, and if any of the women in his family need it, it’s likely he’ll be sure that they get it. If somebody else needs it and can’t get it, that’s not his problem. I mean, he might donate a few dollars to help someone out who really deserved it, but beyond that why should he be concerned? He’s got his, and will take care of his own. Anyone else isn’t really his concern. What does anyone else’s health issues have to do with him , anyway? My point isn’t to pick on Kyl. He’s not alone in his views, after all. As noted before, his views are echoed in various places all over the country, and on issues ranging from health care reform to mortgage reduction, public education, and worker’s rights — as Alicia Morgan learned from overhearing Cable Guy’s” “Don’t work at Wal-Mart” routine. You’ll hear conservatives say, “If you don’t want to work at Wal-Mart, then get an education and work hard and you won’t have to.” Pull yourself up by your bootstraps; put your nose to the grindstone; have some self-discipline. The old ‘personal responsibility’ routine. In other words, a job that pays so little that a full-time worker is still below the poverty line and is eligible for welfare is fine and dandy – as long as it’s not me working there? That’s the essence of the conservative worldview: as long as I’ve got mine, I don’t care if you have yours. The idea of everyone pursuing his or her own self-interest, then by the invisible hand, the self-interest of all will be maximized, or in the parlance of the Eighties, “Greed is good!” – is the one-size-fits-all answer to poverty, to injustice, to inequality. But what it boils down to in real life is “I’ve got mine.” The idea that every person that works full-time is due enough compensation to support themselves, let alone a family, doesn’t even enter into the calculation. It’s okay for other people to be underpaid, overworked, taken advantage of. All that matters is – it’s not me. Attitude of “every man for himself, survival of the fittest, devil take the hindmost”, … but also, that all the possible advantages (however gained), success (however won) and satisfaction (whatever the cost to others) belong to me first!” Narrow-focus, narrow-gauge pseudo-Darwinian selfishness glorified as a sensible philosophy of society and life. It’s translated back on our side of the pond, and spews forth from the mouths of health care reform opponents like Katy Abram, who confronted Arlen Spector in a town hall meeting. An increasingly hard-up working and middle class who were already living in terror of dislocation and poverty are now seeing threats to their well-being amplified by recession. The American dream (and reality) for such people was expressed through ownership of property. However meagre their actual possessions may be those possessions are theirs … Anything that smacks of “socialism” really does seem to be both alien and menacing to such people. …”These programs are being funded by me, my husband, our friends, our family,” Abram complained to Lawrence O’Donnell on MSNBC’s Hardball. No acknowledgment of any contributions by the Others. Normal people’s property, real Americans’ taxes may help pay for programs that benefit abnormal, lesser Americans. That’s socialism. There is no “we” in this myopic view, no welcome for your tired, your poor, your huddled masses of fellow Americans, much less immigrants. There is only my family, my friends, my neighborhood, my church and my ethnic group, a view that is sadly widespread. America is for people like me. Others need not apply. I’m all right, Jack. As Anna N. at Jezebel noted, Abrams “does get that some people can’t afford health insurance,” but believes that “the goodness of people” should be enough to take care of such problem, even though she herself knows how naive that is. Goodness, to quote Mae West, has little to do with it. And goodness will hardly be enough. And that’s during reasonably good times. As I noted in earlier, a good bit of the anger seen over health care reform is coming from people whose communities and families have been particularly devastated by the current economic crisis, but also worn down by 30 years of “free trade” policies that freed them from their jobs (along with decent wages and benefits) the jobs from U.S. soil. Sure, their cries of “I want my country back” at times probably do reflect a nostalgia for an America in which they could at least be sure the guy in the White House looked like them. But the country they want back — where they could count on jobs that enabled them to take care of their families, educate their children, and build some degree of financial security — wasn’t lost on November 4, 2008, or on January 20, 2009. That America was lost by degrees, as policies changed, jobs disappeared, corporate profits grew. That loss had the dual effect of increasing economic inequality, and increasing a tolerance for inequality that grew into a “mean streak in the U.S. Mainstream.” Hardened into a culture of cruelty, it cuts off our concern for others. People in these positions bemoan the growth in inequality. They all agree that there should be greater redistribution from the rich to the poor. But in almost every case, “rich” is defined as someone richer than the speaker, and “inequality” tends to mean their own sense of being unequal. No one I talked to about this, left-leaning or not, felt any enthusiasm for paying more towards some general good. 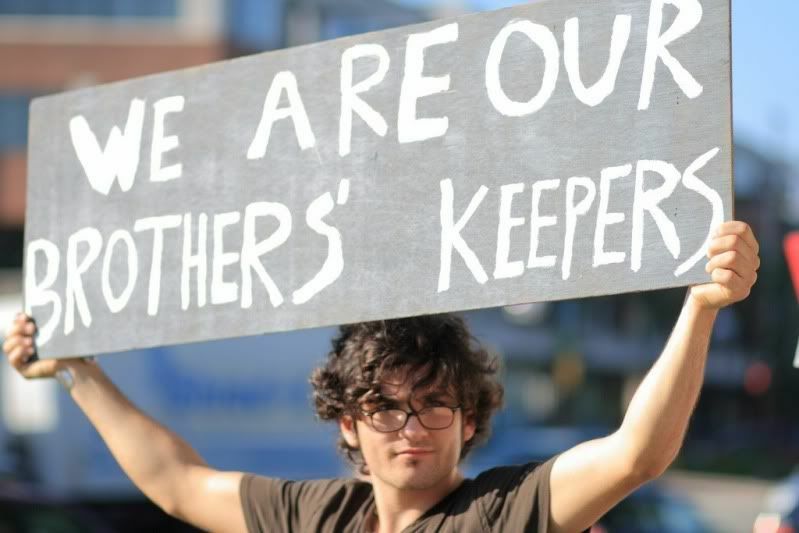 They not only feel under financial pressure, but they are increasingly conscious of living in a harsh world in which they must secure their own pensions, pay for their own dental treatment and care in old age, and attempt to protect their children from the consequences of living in an era of global competitiveness. Everyone is now aware that as the rewards for reaching the top have grown exponentially, so the penalties for failing have grown more savage. As one Labour-voting father said, inequality eats away at the spirit of community. He feels he can’t risk his children falling to the bottom, and he wants to use what he has to help them, rather than contributing more to the common pot. This closing down of concern for others is echoed by Scandinavian research. Academics discovered the middle classes supported greater equality of opportunity in education only as long as the middle class was expanding – in other words, only on condition that their children’s social position was not threatened by others’ upward mobility. Last week researchers at Oxford University concluded that Britain was in just that position. There was a big expansion of the middle classes from the 60s to the 90s, but the academics warned it was a one-off event. From now on, any upward mobility would have to be matched by someone else’s downward mobility. What this implies is that the traditional left denunciation of inequality may not be the rallying call it was. More of us are feeling the pain of inequality, but we are increasingly fearful that we, individually, might suffer if we are asked to redress it. It’s why the Tories’ plans to tax non-doms and cut inheritance tax were so instantly popular. They appealed both to people’s indignation and their self-protective instincts.